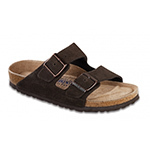 Birkenstock has a passion for their products, an appreciation of their heritage and a genuine belief in their benefits. To that end, The Birkenstock business is a reflection of what they choose to represent - quality products that are comfortable, unique, timeless and respectful of the world around us. In a word, trendscendent. Birkenstock USA began over 40 years ago when our founder, Margot Fraser, had a dream of sharing the comfort and health benefits of Birkenstock footwear. A few years earlier, while visiting a German resort, she had tried on her first pair and was extremely impressed at how good they felt. From there, Margot learned that the original Birkenstock contoured footbed was invented and manufactured in Germany by Konrad Birkenstock in 1897. In fact, the Birkenstock family has been shoemakers for over 230 years – more than two centuries of creating and perfecting a tradition of walking comfort. In 1966, Margot began importing Birkenstock footwear from Germany in small amounts and thus Birkenstock USA was born. The business grew every year and thousands of satisfied customers asked for more styles so they could wear their Birkenstock footwear in more places. 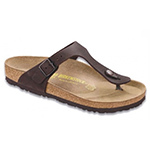 Today, Birkenstock USA has enjoyed enormous success and continues to grow with many different styles of sandals and shoes.